A meteoroid is a small rocky or metallic body travelling through space. Meteoroids are significantly smaller than asteroids, and range in size from small grains to 1 meter-wide objects.Most are fragments from comets or asteroids, while others are collision impactdebris ejected from bodies such as the Moon or Mars. From a meteoroid to a meteor and meteorite: how a meteoroid enters the atmosphere to become visible as a meteor and impact the Earth’s surface as a meteorite. The visible streak of light from space debris is the result of heat as it enters a planet’s atmosphere, and the trail of glowing particles that it sheds in its wake is called a meteor, or colloquially a “shooting star” or “falling star”. A series of many meteors appearing seconds or minutes apart, and appearing to originate from the same fixed point in the sky, is called a meteor shower. Incoming objects larger than several meters (asteroids or comets) can explode in the air. If a meteoroid, comet or asteroid or a piece thereof withstands ablation from its atmospheric entry and impacts with the ground, then it is called a meteorite. Around 15,000 tonnes of meteoroids, micrometeoroids and different forms of space dust enter Earth’s atmosphere each year. The asteroid belt is the source of the slow-moving meteors, which are assumed to originate from collision between objects in the asteroid belt. The Geminides are a good example of this type of meteor shower. Comets have often been compared to “dirty snowballs” that orbit the Sun. They release rocky material as the heat of the Sun causes them to slowly disintegrate. Comets are the source of the fast-moving meteors. The Leonids are a good example of this type of meteor shower. These are very rare and unpredictable, so they would not be part of any well-known meteor shower. However, their velocity could be very high as they would not be in orbit of the Sun (by definition) and would be following hyperbolic trajectories. I will not be addressing this case here. All estimates of meteor velocity that I have seen involve a discussion of escape velocity. Escape velocity is the lowest velocity that a body must have in order to escape the gravitational attraction of a particular planet or other object. We can compute the escape velocity by computing the work that a massive body does on a meteor. Equation 1 gives us the force on the meteor exerted by the gravity of an attracting body. G is the universal gravitational constant. r is the meteor’s distance from the attracting body’s center of gravity. MBody is the mass of the attracting body. mMeteor is the mass of the meteor. FMeteor is force of attraction on the meteor. We can use Equation 1 to derive Equation 2, which is the work (i.e. energy) performed on the meteor by the gravitational field of the attracting body. EMeteor is the work performed on the meteor by the attracting body. RBody is the radius of the attracting body (I am assuming the attracting body is spherical). Equation 3 equates the kinetic energy of the meteor with the work performed on the meteor by the attracting body. where vMeteor is the speed of the meteor. 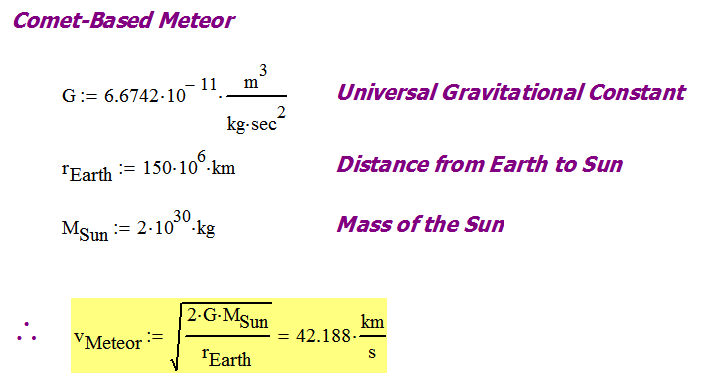 We will use Equation 3 to estimate the speed of the meteors entering our atmosphere. In this case, we assume that the meteor has somehow broken free of an asteroid with negligible velocity and has simply fallen to the Earth. This means that its velocity at the surface of the Earth will be the escape velocity from the Earth. Figure 2 illustrates the calculation. Figure 2: Illustration of Velocity for a Meteor Originating in the Asteroid Belt. 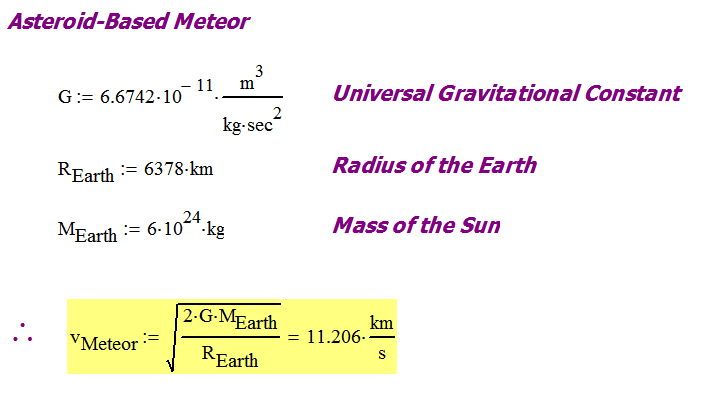 This calculation explains the 11 km/s speed sometimes quoted for slow meteors. Comets orbit the Sun and the meteors generated by comets move at the velocity of a comet. These meteors really are orbiting the Sun and just happen to slam into the Earth. Figure 3 illustrates the calculation of their velocity. Figure 3: Velocity of a Meteor Originating from a Comet. This calculation explains the 42 km/s mentioned in the Wikipedia. The Wikipedia also mentions the peak velocity is 71 km/s, which is the speed of a comet-based meteor slamming heading on into an Earth that is moving at 29 km/s around the Sun. I have seen the speed of meteors estimated to be anywhere from 11 km/s to 71 km/s. This post has shown where these numbers come from and they appear to be reasonable.